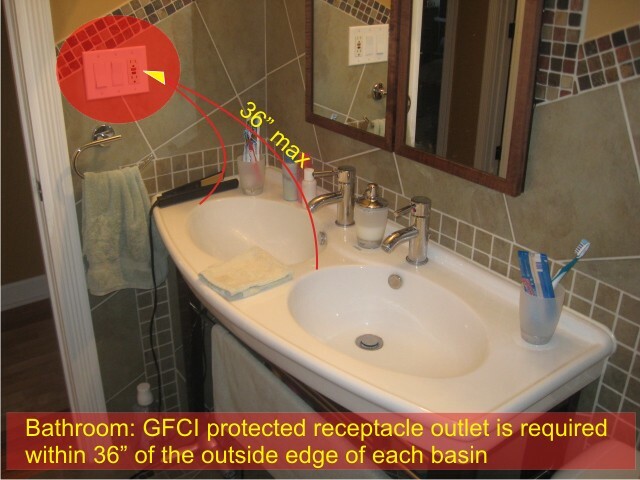 Bathroom GFCI receptacle protection is required by the NEC (National Electrical Code), and of course by a common sense – why would you risk getting electrocuted if you can secure your safety by installing GFCI outlet. Since some bathrooms are currently equipped with many electrical current hungry devices, bathroom electrical power supply requirements had to be slightly adjusted. We used to have a bathroom sharing an electrical circuit with exterior outlets, the kitchen, and a garage – not anymore. Of course, the minimum bathroom electrical requirements listed below are not going to work if you add a steam shower, heated electric floor, hydro-spa heater, several light fixtures, heat lamps, etc. For all that additional equipment load calculation would have to be performed, but now, let me cover the basics. The minimum requirement for a single bathroom electrical supply is one, 20-ampere rated electrical circuit. This electrical circuit should not be used for anything else than outlets and equipment within the bathroom. 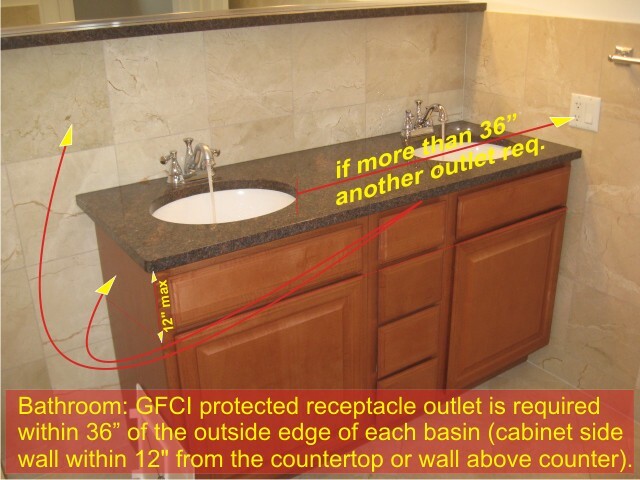 Bathroom GFCI receptacle must be located within 3’ (36″ / 900 mm) from the basins outside edge. The same rule applies for multiple sinks / additional bathroom receptacles must be installed if necessary. 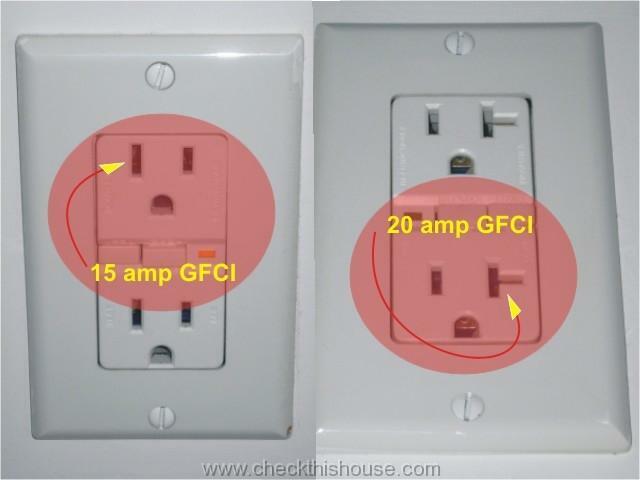 If you are replacing an old, not GFCI type bathroom receptacle, you have to install currently required GFCI type outlet in its place unless this circuit is already protected by another GFCI receptacle or GFCI breaker. Using a GFCI breaker should be done with caution because the device will not protect ungrounded electrical installation. 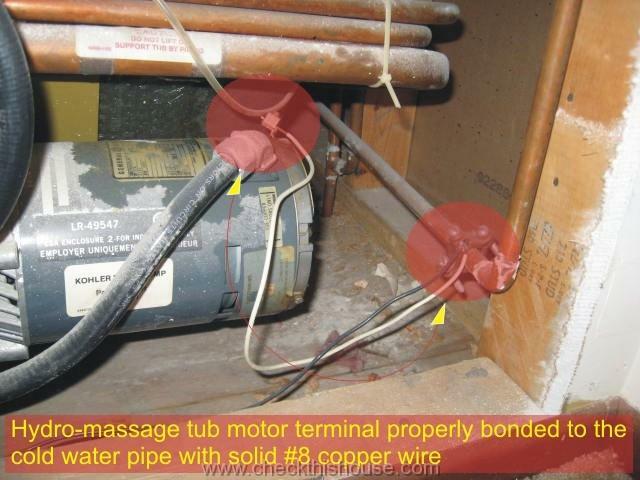 Hydro-massage tub must be protected by a bathroom GFCI receptacle or GFCI breaker, and must have a disconnecting means in sight of motor – most of the tubs have a cord and plug which can be simply pulled out of the socket. Hydro-spa with a hard wired motor should have a ON/OFF switch mounted in sight of motor. 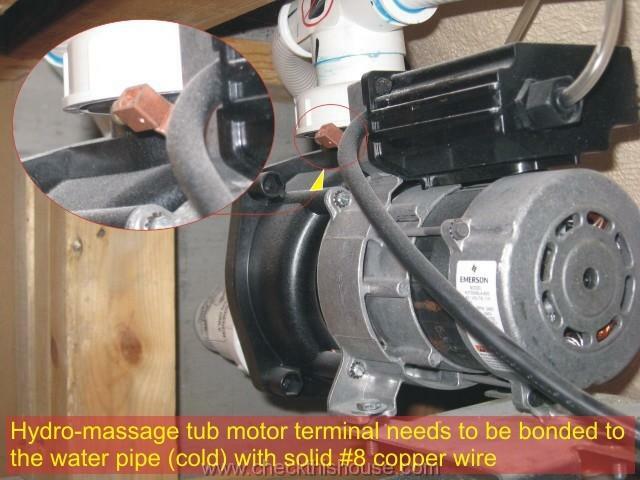 Hydro-massage tub motor terminal needs to be bonded to a water pipe (cold) with solid #8 copper wire. The bonding is prohibited for a listed double-insulated type motors (it should say on the motor label, and there will be no terminal). 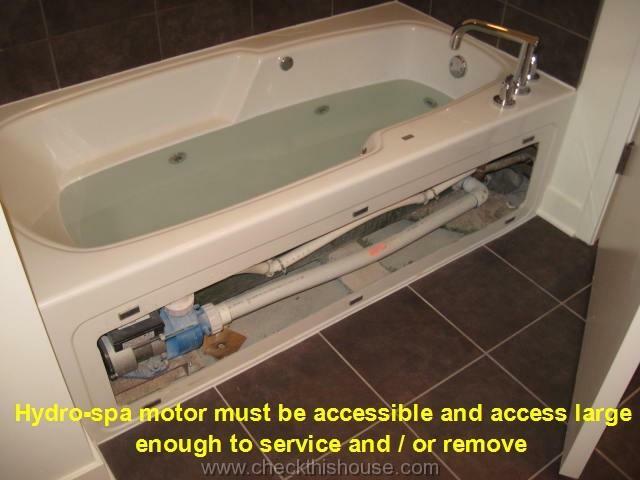 Hydro-massage tub motor must be accessible, and the access panel large enough for servicing including motor replacement. There are some types of light fixtures listed below that are not permitted within a certain area in the bathroom. This area is located directly above the bathtub and the shower stall, and additionally extends 3ft (0.9 meter) horizontally, and 8ft (2.5 meter) vertically from the bathtub top rim and the shower stall threshold. 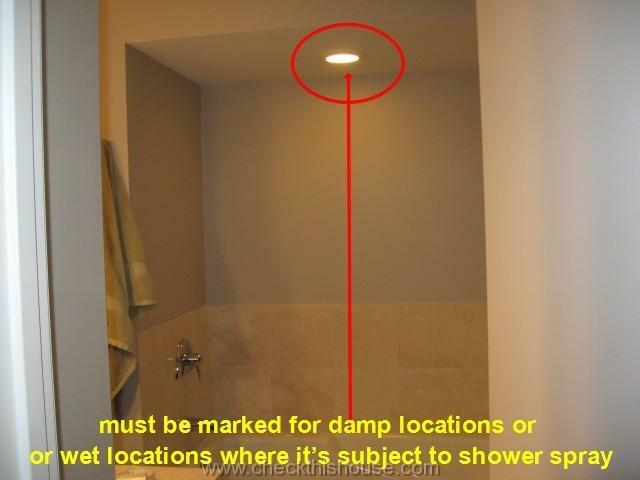 Any electrical light fixture located within that area must be marked for damp locations or wet locations where it’s subject to shower spray. 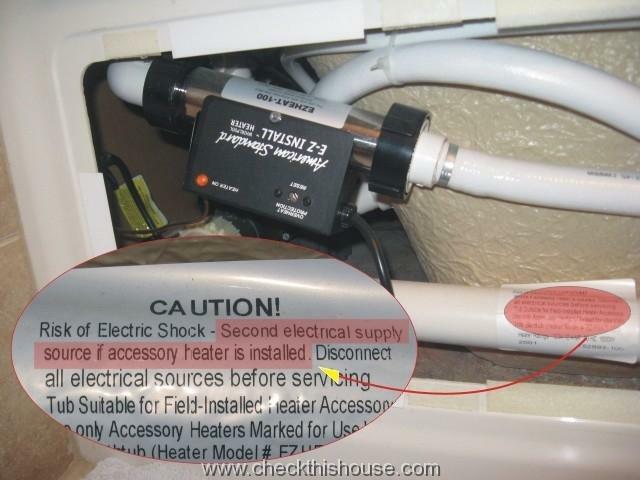 After seeing peoples’ lack of common sense in many hazardous situations, I always recommend to put any of the bathroom electrical light fixtures located above the bathtub and / or shower stall on a GFCI protected circuit… but that’s your choice (it is not required by code but may be in your local jurisdiction and / or light fixture manufacturer requirement). Final bathroom electrical pledge – please, no electrical panels in the bathroom, and remember that properly installed bathroom GFCI could save your life.